At the end of last week, some kindergarteners had an interesting surprise! 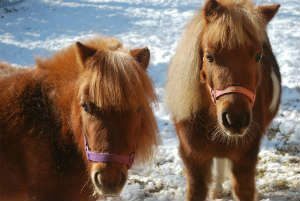 Two miniature horses came to Kahakai Elementary School for a visit. The horses rode along with some volunteers from the Therapeutic Horsemanship Hawaii – Kona. The goal of the horses’ visit? To teach the kids about how to properly care for animals. Lots of children want animals as pets, but don’t understand the responsibility and work involved. The group wanted to demonstrate that to them. Nancy Bloomfield, the program director, is called the Therapeutic Horse Mom by other volunteers in the group. She started the presentation by talking about how much food the horses, Calypso and Peaches, eat each day. She also showed the kids how to brush the horses – and they got to try themselves. The horses that visited are also therapy horses. The program, Therapeutic Horsemanship Hawaii, helps both children and adults with special needs. This generally involves riding sessions with the horses. The horses are shorter than thirty-eight inches and are actually house-trained. They visit many different institutions, including schools, hospitals, daycares, nursing homes, and more! And, the horses have been around for awhile now. Calypso is twenty-two-years-old, whereas Peaches is seventeen-years-old. In fact, Peaches is a former trail ride horse. While they came to visit the kindergarteners to help teach them, because they are trained as therapy animals, they knew how to remain calm and showed patience with the kids. Hopefully, with Calypso and Peaches’ help, the children now know more about how to take care of animals, as well as the love that animals give back in return. What do you think about the program? Should more schools implement a similar idea?